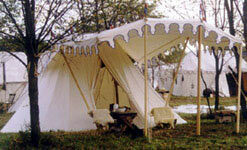 Panther Primitives - Medieval Pavilions and Tentage - The Best Tents in History! All Panther tentage is available in at least 3 different canvasses. Our Medieval Pavilions are available in a colored canvas, which allows you to choose from 7 colors! This tent has less usable space with it's curved ends, but you'll have to agree they really add to the looks of the tent. This is a very roomy tent. It's 6' or optional 7' walls give you plenty of room for your 4 poster bed, your armour, your gowns for court, and anything else you may require. We carry 33 square and rectangular sizes and, of course, can always make custom sizes. 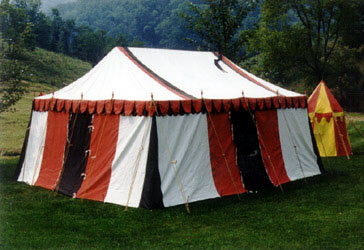 This tent is a round version of the marquee tent. This tent is made to set up with 3 poles instead of a free-standing framework. 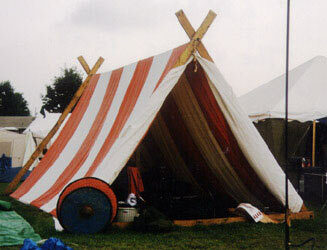 These are available in the same 4 sizes as the Viking tent. Also available... 17 different wedges in our wedge tent section. This tent can be set up with only 2 or three poles. 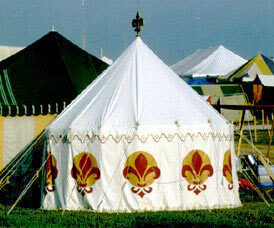 The bells on both ends make this a very attractive tent. 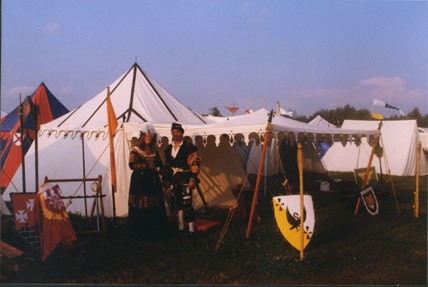 The medieval Viking tent is supported entirely by a free-standing framework of poles. 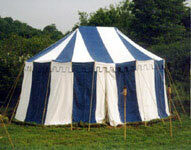 These are huge tents with the largest one measuring 14'7" wide X 17'3" long and 11'5" tall. A square roof portion with a base that forms an octagon. Lots of room with only 5 poles needed for set up. 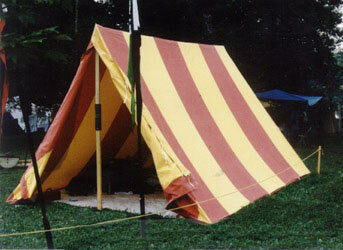 This is a one piece tent. 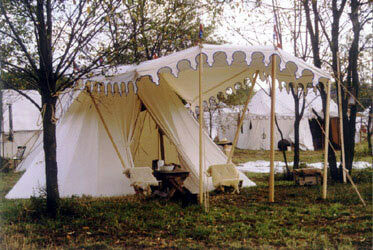 Check out our Tents of the Fur Trade section for our wall tents and a wide variety of flys, options and set up packages.